At the risk of you thinking I spend all of my time eating and drinking, the BH suggested this topic as my next one and I can't resist. 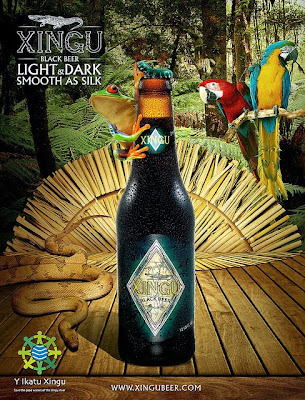 I actually can resist the beer itself--I am no fan of dark beers and Xingu (pictured above) is one. I almost named a black labrador Xingu, by the way (I already had a blond labrador named Chopp which is Portuguese for draft beer). It is a fun word to say: you pronounce it "Shin-GOO." Xingu has a happy story, and a less happy one. Xingu as a name comes from the Xingu River near the Amazon. The word is translated from Kamayurá as "good clean water." According to wikipedia, the Xingu people are made up of 15 indigenous groups and all four of Brazil's indigenous languages. There are more than 25,000 people living near this river, a tributary of the Amazon. Link is here in case blocked on your computer: https://www.youtube.com/watch?v=c5tPxfmBj44. So, that is the unhappy story. The scary story. I have to update myself on what is going on with Belo Monte--I confess to have lost track of the construction of this colossus. 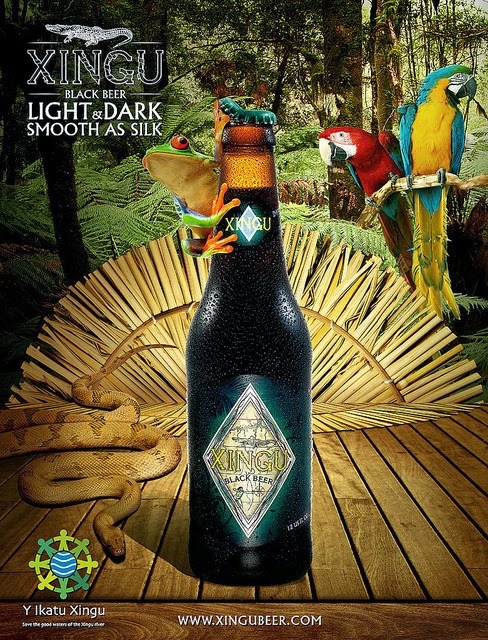 In terms of the Xingu name on the beer, the story does involve the CIA but not the one you think. The beer brand was created by Cesario Mello Franco in 1987, in conjunction with Alan Eames, a writer who focused on the history of beers. Mr. Eames had discovered a black beer that was registered in the year 1557 and produced in the Amazon. The beer was made from corn and manioc, and naturally fermented. Based on this past, Mr. Franco and Mr. Eames found a small microbrewery to brew the new Xingu. After many tests, Xingu was brought to the CIA. Not that one. The Culinary Institute of America. It was a great success, and the beer was first launched in stores and restaurants in the USA. Then the Brazilian beer made its way home, and the Brazilian rights sold to Femsa and then incorporated into Heineken. Many prizes followed and the beer is marketed in the USA, England, Australia, Italy and other countries, in addition to Brazil. My source for all of this is here. So the happy story and the unhappy story of Xingu do not meet. There is no link between the brewery and the indigenous folks who struggle to stop their homeland from being flooded. No reason to stop drinking one in order to help the other. I do find it ironic, however, that the advertising above shows the animals of the Amazon, which will also be adversely affected by the dam.